Today’s Orthodontic treatment is not just for children. The idea that braces are just for children and adolescents is an old one. Today, more and more adults are realizing that maintaining a healthy and beautiful smile is an important part of how they are perceived. Drs. 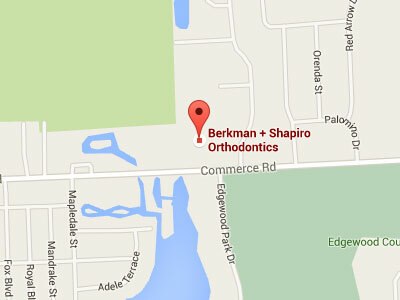 Berkman & Shapiro particularly enjoy working with adult patients. We recognize that adults have different needs and goals than children. Therefore, our approach to adult treatment is comprehensive, and takes health, function, and esthetics all into account. Will treatment take longer for my adult treatment? Actually, treatment time is typically shorter for adults. Although there are many reasons for this, one is that adult treatment is typically unrelated to the growth of the jaws. Because of this, the focus of treatment is more directed at the teeth and the smile, and this reduces the time in treatment. Is there a health benefit to orthodontic treatment? Straight teeth are easier to clean. Additionally, many of the problems associated with aging teeth (enamel wear, loss of some gums, etc.) can be best addressed with orthodontics alongside regular dentistry. Whereas veneers can provide a straight-appearing cover for crooked teeth, veneers don’t address any crooked tooth roots. Orthodontics, however, straightens the tooth and the root. A set of veneers are also very expensive. In many cases they are nearly double the cost of adult orthodontic treatment. Will I need to wear a retainer as an adult? All patients, no matter what age, are given retainers to wear following treatment. There are many options for adult retainers, and oftentimes they are only to be worn at night or a few nights each week. Some retainers are even permanent and lie behind the teeth, so you don’t need to ever worry about putting your retainer in. Retainers are a wonderful way to help minimize any relapse and keep your smile looking beautiful for a long time to come.